Description: The Aico Villa Valencia. Inspired by the rich heritage of the City of Valencia. The Villa Valencia Bedside Chest in Classic Chestnut is beautifully constructed by skilled craftsmen and artisans from birch solids, cherry, pecan veneers and elm burl. 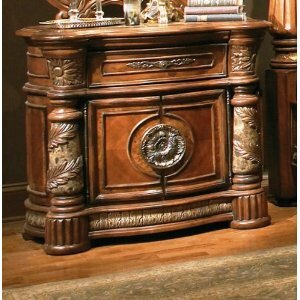 Its carved accents will create a unique ambience for your home.